ICAO established the Alternative Fuels Task Force (AFTF) to answer the key question: how much do biofuels actually reduce greenhouse gas (GHG) emissions? 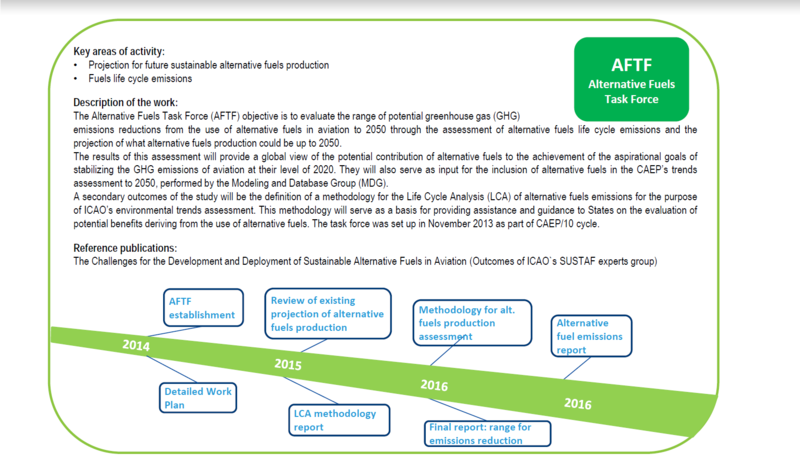 The AFTF is close to finalizing its answer. EDF, WWF-UK and our colleagues in the International Coalition for Sustainable Aviation are working to secure an MBM of high environmental integrity for international flights. Getting biofuel carbon accounting right is vital. If biofuels reduce carbon pollution, then airlines’ obligations under the MBM will decrease. But if biofuels increase carbon pollution, then airlines’ MBM obligations will increase. Increasing biofuel demand doesn’t necessarily lead to enough additional plant growth to offset the combustion emissions. The “carbon neutral” approach ignores the warming effect of CO2 emitted by burning biofuel. Biofuels can achieve “additionality” if they use wastes that would otherwise burn or decay, or if the biofuel production increases the carbon stock on the land where biofuel feedstocks are grown. Biofuel production is not “additional” when it uses existing crops, or when it leads to land use change (LUC) – directly or indirectly destroying ecosystems to make room for biofuel crops. Direct land use change (DLUC) occurs when existing ecosystems are replaced by biofuel plantations; for instance, when farmers slash rainforests to make way for palm oil plantations to supply biofuel. This releases huge stores of carbon that could take hundreds of years to recoup. Indirect land use change (ILUC) occurs when using existing crops for biofuels triggers ecosystem destruction elsewhere. For example, if a maize farmer that originally sold to food producers starts selling to biofuel refiners, maize supply for food could go down and prices could go up. Higher prices could encourage others to create new maize farms to meet the supply shortfall. The original farm will not reduce net atmospheric carbon emissions by selling its already existing crops to a new buyer. The new farms could increase net atmospheric carbon by chopping down native vegetation to make room for new crops. LUC-related emissions have been shown to outweigh the carbon savings of certain biofuels. Therefore, AFTF’s biofuel carbon accounting formula must account for the CO2 emitted from direct and indirect land use change (DLUC and ILUC). Biofuels must only be sourced from areas where the GHG emissions and removals in the land sector are measured, reported and verified in accordance with internationally recognized standards, and where regulations exist to protect vulnerable ecosystems. Certification schemes can guard against many of the potential negative impacts of biofuel production, including direct land use change. The Roundtable for Sustainable Biomaterials (RSB) scheme is currently being updated with an additional module to address ILUC risks too. Once verified, these additional carbon reductions could be counted towards offsetting aircraft combustion emissions. ICAO must also avoid double-counting: If emissions reductions from using biofuels count towards international aviation’s goal of carbon neutral growth from 2020, then those emissions reductions cannot also count towards a country’s national emissions reduction goals. Most land where biofuel crops can grow is already home to important ecosystems. Moreover, biofuel crops need a lot of land to be scalable, competing with increasing demands for land for other uses. Thus, while low-emitting biofuels can play a role in reducing international aviation emissions, they can’t play the main role. ICAO should remain focused on its other measures: establishing a robust MBM with maximum environmental integrity, and continued technical and operational improvements. Coupled with full carbon accounting for biofuels, these measures can ensure that ICAO learns from the science, and from past policy experience, to incentivize only low-risk biofuels with undisputed carbon savings.